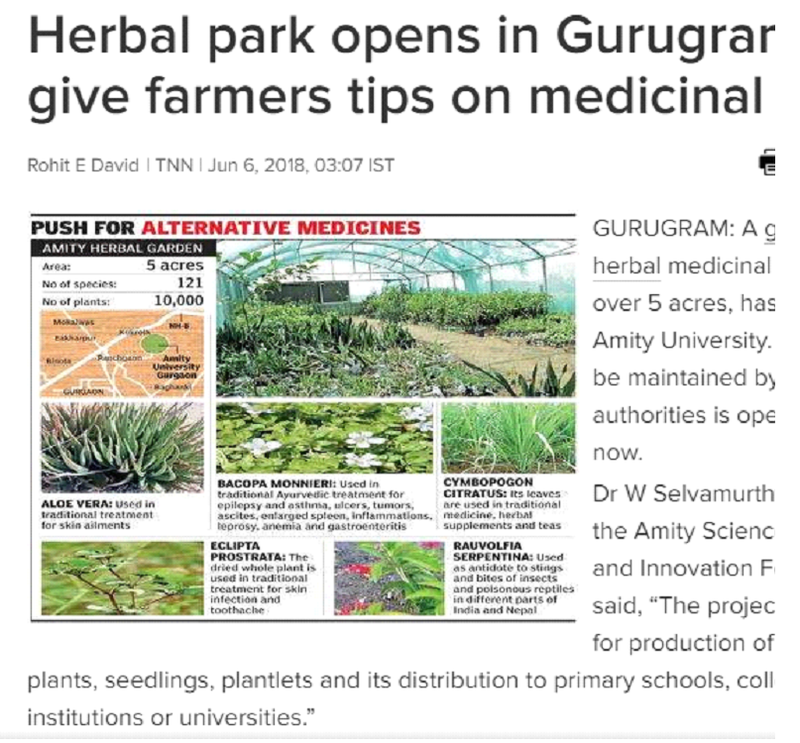 A garden of herbal medicinal plants, spread over 5 acres, has been set up at Amity University. The garden to be maintained by the university authorities is open to the public now. Dr. W Selvamurthy, president of the Amity Science, Technology and Innovation Foundation, said. "The project was started for production of medicinal plants, seedlings, plantlets and its distribution to primary schools, colleges, institutions or universities." The Centre for medicinal plants and traditional knowledge was established in Amity University in 2010 and the herbal garden has been developed over the years by the incorporation of at least 121 plant species, including Aloe Vera, Cymbopogon citratus (lemon grass). Rauvolfia serpentine (Indian snakeroot) and Bacopa monnieri (water hyssop) and Eclipta prostrate (false daisy). At present. The garden has more than 10.000 herbal and medicinal plants. They will be encouraged to produce herbal plants and local medicines in their own farms to incentivize alternative treatments such as Ayurveda. Homeopathy and Siddha. Lauding Amity for its work and talking about the collaboration. Shripad Yesso Naik. Union minister of state in the AYUSH ministry said. "It is our responsibility to promote this (alternative medicines) across the globe." According to the officials of National Medicinal Plants Board, there are at least 6,000 flowering plants which have medicinal use in folk and alternative forms of medicine. A study by the board revealed that at least 178 species are commercially used for alternative treatments in the country and each of these are required to be produced in excess of 100 tons per year. The domestic trade of the AYUSH industry comes up to nearly Rs 80 billion and exports come up to nearly Rs 10 billion. However, farmers are not able to meet the requirements of the industry. "We will try to encourage local farmers who visit the herbal garden to cultivate these plants," said Dr. PB Sharma, vice-chancellor of Amity University, Haryana. Students enrolled in the biotechnology programmers in the university conduct different research activities in the garden and add to the overall knowledge base. Shrayanee Das, a Ph.D. scholar, said, "The garden helps students to work in the area of herbal plants and local medicines procured from them." Bhawna Rao, a fourth-semester student, BSc Biotech, said, "With the inauguration of this garden, which also acts as a medicinal plant distribution Centre, students will learn a lot about herbs, its quality, and efficiency."